In collaboration with the Canada's Research Chair on Digital Humanities, the CRIHN organize one of the sessions at the virtual conference "Around the World: Digital Media in a Post-Truth Era", thursday 4th May at 11 am: "Post-truth and Authority". According to Oxford dictionary, the word of 2016 is Post-truth, defined as a adjective "relating to or denoting circumstances in which objective facts are less influential in shaping public opinion than appeals to emotion and personal belief." The Brexit and Donald Trump's election at the presidence of the United States were the context where the term "Post-Truth" was the most employed, particulary in reference to the circulation of fake news on social media. This was possible, they say, because of the lack of ultimate authority which can assure the validity and the truth in those news. This lack, is it implied by the web's structure? On the web, is that true that there is no authority? What makes authority on the web? What is the truth in Social Media Era? This round table's purpose is to think about this themes, try to have a better comprehension of our era and, maybe, give an answer to those questions. "The Around the World Conference is an experiment that brings together a research dialogue without the environmental cost of traditional conferences. Institutes and researchers are invited to participate either through presenting or by joining in the discussion. The conference is live-streamed world-wide and archived after the event. 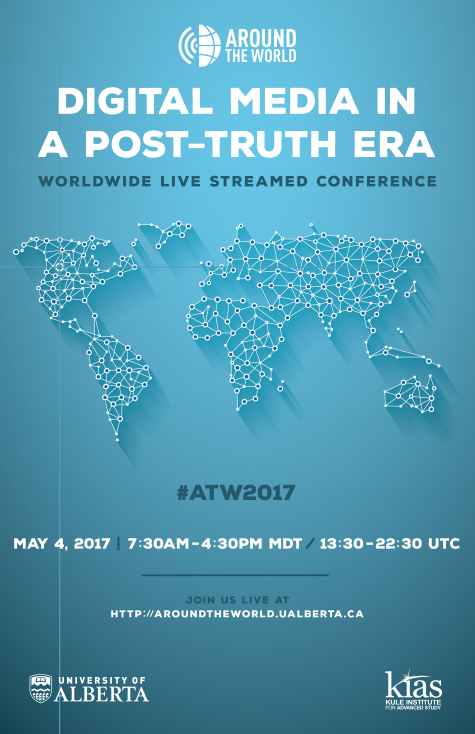 This Year’s Conference, Digital Media in a Post-Truth Era, will take place on May 4, 2017. Why the theme of “Digital Media in a Post-Truth Era? The unfolding of recent political events in the United States has sparked much debate around ‘fake news,’ disinformation and trustworthiness on the web. We hope to use these developments as a starting point for a broader discussion of how digital media has challenged and/or unsettled our notion of truth. The conference theme of ‘post-truth’ is loosely-defined and we welcome considerations of this topic from a wide range of perspectives: from the algorithmic to the philosophical. We welcome, as well, discussion of ‘post-truth’ as a notion reflecting a certain insularity and how questions of the ‘truthiness’ and the web resonate differently across the world."